An important part of improving your ranking in search engines is frequently writing good, high-quality content for your site. More specifically, this content should be interesting and/or useful. Good content gets linked to and shared. Gaining links to your site and its content is the most important factor in improving your position in search results and growing your search traffic. A common concern, especially among designer and developers, is about the potential ethical issues that relate to SEO and creating content purely for bots. As it turns out, the best and most important SEO activities you can do are all very straightforward and beneficial to your readers as well. After all, Google wants to return results that people like! The checklist below covers the things you'll want to do when writing a blog post to make sure that Google can understand what your page is about. If your content is good it will earn links. If Google can figure out what it's about, it will show up in the results for its topic. We've based the items in this checklist on our experience, on being decent to readers, and most importantly, the SEOMoz Search Engine Ranking Factors. Each year, SEOMoz surveys top SEO consultants (this means ethical ones!) on what the most important ranking factors are. Using the on-page factors are a great way to know how to work on your content. So without further ado -- here is the checklist. If you want people to know what your blog post is about, give it an informative title. The same is true for search engines who are particularly sensitive to the words at the beginning of titles. If you're not sure what a title tag is, it is the text that shows up in the top of your window or browser tab. An H1 tag is usually the tag that will surround the main title of your post. All good CMS software allows you to change this. You can't quote 90% of an article, put in a little commentary and expect Search Engines to rank it well. Write a post that is thoughtful and unique and it will rank for the keywords you write about. A very strong indicator of what your page is about is in the keywords that are being linked. As an example, you can see breaking news on CNN. The same is true for pages you link to. When you link to a page about "famous presidents" there is a good chance that you are writing about that topic. Search Engines notice that kind of thing and take it under consideration. Never write "Click here to read about famous presidents". It's unnatural for humans and search engines. Unless you are writing for Vanity Fair or the New Yorker, the introduction to your post will probably be used as a signal as to what your post is about. Search Engines know this and take it under consideration. Your Content Management System should allow you to control the URL of your post. Just like your headline, use a url that is readable and a signal as to what your post is about. As mentioned in item three, the links you use can be a strong signal to whether you are writing about a particular topic or keywords. The same is true when it comes to using links at all. If you are writing a helpful post on a particular topic, an honest and useful thing to do would be to link to other pages that contain helpful information. While original works or other 'link endpoints' can and do rank well, those are not as typical. There are plenty of other places you can include keywords. Any time you're using something other than plain old paragraph text you're giving extra emphasis to something, make sure you're being informative. Having a meta-description isn't super important for ranking, but it shouldn't be neglected. 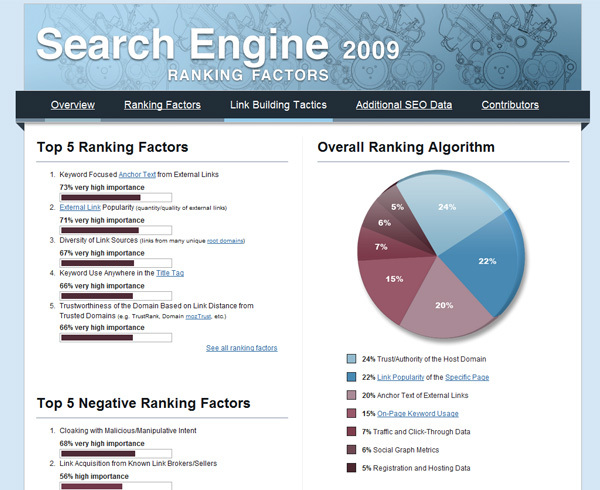 The meta-description is often used on the results page as the description shown to searchers. Make it short (under 150 characters) and clear and tempting for searchers to click on. 9. Are you being sensible? Are you being ridiculous? Jamming the same keywords everywhere you can find? First of all, this just doesn't work, and hasn't worked since roughly the (first) dot-com bubble. Search engines look for "keyword stuffing" and penalize appropriately. So write for people and use keywords for clarity. Remember, you're trying to produce writing for people first that is great and worthy of earning links and being shared. These are the most important factors in SEO so it would be foolish and counterproductive to make your writing terrible and unoptimized for people. Hopefully this is a helpful list. To be clear, it is not a guide to writing for the web or even for writing at all. I find that it is best to write naturally and use a list like this for formatting or minor tweaks. Following these steps will help you produce well optimized content, but it won't change your rankings overnight -- a successful SEO campaign takes a while as you build up your site's ranking from accruing links and generating new content. Is it important to open the link in the same window, thus driving people away from your site? Do you get more SEO "points" for that vs. opening a link in a new window? Also, when linking outbound, does it help your SEO standing to link outbound on the keywords you are targeting? There is no difference for links when it comes to SEO when it comes to opening in a new window. When linking outbound, the consensus is that it does help to link keywords that you are targeting. I Think you missed one rel="author/me" tag that Google announced to support recently. In your article, you shared a great checklist for blogging. Thanks! A structured approach is particularly crucial when it comes to optimizing a website because the desired effects are mainly the result of long-term and continuous improvements!